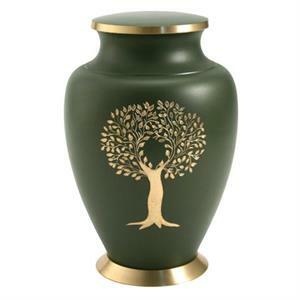 This Tree of Life urn design has, in different forms, touched many walks of life and many religions. With it's broad, firm base to it's delicate leafing, this brass urn, as the tree it depicts, will stand the test of time. Finished with a rich green enamel, the tree and leaves gleam with their bright golden details. The threaded lid keeps the ashes securely inside.